Here at Vocals On Top a lot of opinions are expressed but they are rarely taken on directly and exclusively. Some issues deserve more focus to be put on them and to be discussed in a forum all their own. That is why I am starting VOT Editorials. It will consist of tackling an issue head on and hopefully somebody will read it and agree, disagree or at least think about it for a few seconds. Here is the first installment; The $20 CD. During a recent review for a concert by blues artist Samantha Fish I took a moment away from describing the stellar show to get on my soapbox and proclaim that charging $20 for a CD was too much. As a buyer of thousands of CDs I have very strong opinions on this and felt the need to voice my opinion. 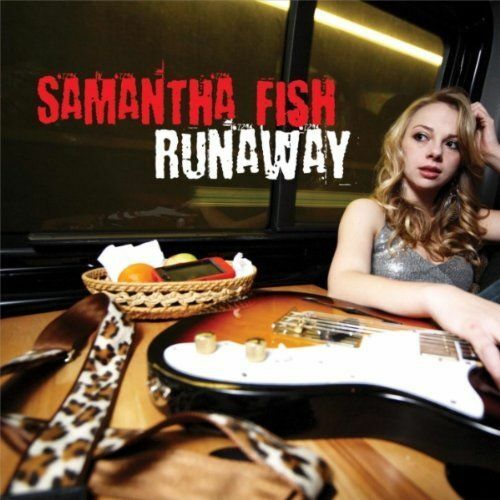 Samantha Fish’ s Runaway CD; it is available for $20 (plus taxes and shipping) directly from her website if you want to overpay for it. Cheap albums sell more copies. Period. Obviously quality of content has a lot to do with sales but ultimately this statement is true. In reality, having a “fan” with a copy of an album in their home is the ultimate form of advertising. It is a lot easier to remember and artist if their album is laying on your desk. I think this greatly increases the likelihood of them attending a future show and buying future albums. How do you get it there? Don’t price yourself out of a sale. It is interesting that the price of albums has very little to do with the quality of the music on the disc. If an artist feels their new record is the best they have ever recorded, should they price it higher? I don’t think so but it is an interesting question. More money is made by artists on quantity of sales and not on the price of the individual unit. A Bob Dylan CD suffers the same pricing structure as a New Kids On The Block CD and that just seems weird. So why not make all CDs $20? People are less likely to buy them, that’s why. Sure artists could make the same amount of money on one $20 CD as they would two $10 CDs but the audience that will hear it is only half as large. Isn’t the real goal of most artists to have their music heard? I realize that musicians shouldn’t be expected to give their art away, they should get money from their art. I am a strong supporter of musicians and especially local artists because I so strongly believe this. I love listening to local bands like Dsoedean, The Motors and The GasTown Lamps but if they were to charge $20 for a 10 song album (as Samantha Fish does) I probably wouldn’t own one. There is also a content loophole here. If it is a double album (like Matthew Coman’s recent Carpe Noctem) it would be acceptable to charge $20 if he so chose. I think that he would sell fewer copies but he couldn’t be blamed for charging the higher amount. If a band were to include a bonus DVD; same situation. If the packaging is somehow deluxe, like comes with a screen printed sleeve or something, it would also be alright to charge a higher amount for the album. The price is currently falling in the $10 – $15 range for a standard CD though. The opposite effect occurred earlier this year when a very unknown indie artist, Ashley Raines, made an extreme point with his pricing structure. He has aggressively fought the piracy of his music (rightfully so) and changed the prices of the only online retailer where you could purchase his album One Trick Mule. I had recently bought this CD from Raines in person (for $10) at a show and it is fantastic. He decided with the amount of piracy he was the victim of he would restructure his pricing. He changed $.99 song downloads to $9.99 each and the cost of ordering a hard copy CD from $10 to $100 for the 11 track album. I don’t know if he sold any at this price but I think it is safe to say he didn’t. I love Mr. Raines’ music and was glad to buy every one of the 3 CDs he had available when I met him. I even downloaded one other album off of iTunes (and I HATE buying digital music). Just because he is the victim of theft doesn’t mean I will pay more for his music though. I would simply buy less of it if the costs were higher, maybe none of it; I do have a house payment. These examples don’t apply to Samantha Fish though. He album Runaway is an award winning album on Ruf Records put out in 2011. It contains 10 songs and fits on one disc. The booklet folds open once and has the standard liner notes, a couple photos, the artwork is very well done and printed on nice glossy paper. None of these things point to it being worth $20 in my opinion. I would like to add that I have seen close to 500 bands live and this is just the SECOND time I have seen an artist charge $20 for a CD. The hard cost of producing this CD was probably LESS than the cost local musicians suffer per copy. She has likely sold thousands of this album and I’m not sure if she has pushed this $20 price tag the whole time. You can get the album on iTunes for $9.90 (like any other standard album) and you can get it on Amazon MP3 for $8.99. A hard copy CD is available on Amazon for the sleek price of $11.29. Go to SamanthaFish.com and try to order the CD and you are looking at $20 for the album and it looks like taxes and shipping still needed to be tacked on! I would’ve seen how much that was but I didn’t want to accidentally buy it, like I said, I have a house payment. So why $20? I don’t understand. All I know is that Samantha Fish is selling fewer units because of this pricing. Congratulations Samantha, I hope this works out for you but I can think of a ton of reasons it won’t. I would love to hear feedback on this. Please let me know what you think. You can email VocalsOnTop at Gmail.com or just hit me up on my Vocals On Top facebook page or simply comment here. This entry was posted in VOT Editorial and tagged album prices, Ashley Raines, cd prices, Dsoedean, Gastown Lamps, pricing structure, rants, Runaway, Samantha Fish, The Motors, Tom Petty, VOT editorial. Bookmark the permalink. With respect to Mr. Raines change to his pricing structure, until recently, Mr. Raines had a house payment to make as well. Between theft and the resolve of entitled folks who believe that music should be free, or even better, that since instruments are so cheap all they need to do to be a songwriter is buy a guitar, what choice was left. Now, everyone who can buy the equipment thinks that entitles them to call themselves a songwriter. The fact is that after 17 years of touring and performing there has been one constant, people dont buy cd’s period. Of course there are exceptions to every rule. But by and large the numbers of folks who would rather argue an even lower price then the $10 Raines charged at his shows far outweighs the ones who happily purchase the disc. You may have purchased Raines records Clint, but how many CD’s did you watch Raines give away at his shows? Here is an anecdote, Mr. Raines was performing in Omaha when two young ladies approached asking if he had T-shirts to sell. Raines response was “No, but we have cd’s and albums if you like”, to which the young ladies responded by looking dejectedly at the floor and walking away w/o buying music. Venues have asked Mr. Raines to travel thousands of miles and perform for no compensation. So called “fans” have haggled over the $10 price. The culture treats life long hard working musicians like they are disposable, like the songwriter should feel lucky to be on a stage in an empty room, like the venue has done us a favor for “letting” us perform. And its really just about consumption. We dont listen to music, we consume it while playing video games and texting and downloading all at the same time. there is no value to a disposable culture. I stipulate that if venues who rely on music to enhance their environment decide to value the music they hire, if folks who purchase the $99 maudio usb realize that that purchase doesnt make them audio engineers, if music wasnt so damn abused then this would be different. I also stipulate that people are sold to records nowadays, not that records are sold to people. Its my view that no one is chomping at the bit for the next Bieber record. But here is the sad fact, after 17 years, 9 albums, a decade + of touring, numerous awards and having recorded with Grammy and platinum record holders Mr. Raines is currently homeless. Not because of addiction, not because of lack of talent or albums that are not good and not because of mismanagement of money, but because of theft, entitlement, crooked selfish venue owners, hackneyed so called bands and songwriters with more friends then talent or more talent at social networking then at writing and playing their instrument. After the “fan” spends all their money on PBR, what $10 is left to even buy a record? It comes down to perceived value. I would pay almost any price for a record i valued. you would too. The same people bitching about a $20 cd seem to have no problem dropping $80 on call of duty, or $20+ on a case of beer. or better yet, why buy a cd at all, just buy the maudio for $99 and make your own record on your ipad, make 10 of them, make 50 of them (just make sure to use your parents money or your student loan money)………….and when no one buys them you can go back to your call of duty or your fine micro brews, lamenting the time when you used to be in a band making records no one buys. Thank you for the feedback Pavel, Mr. Raines is a great example of how modern music is now valued. The fact that a man of such immense talents (that I have had the honor to see in person) is struggling is sad. A world where a fan wants a tshirt instead of a copy (in some form) of music is horrifying to me. By no means am I saying music should be free. Artists that deserve it should be compensated but the sad result is that the demand for such talent as you said, devalued by imitators. The issue at hand here actually has little to do with music, it has more to do with business and the economy. Music is simply used as a microcosm of the problem. With all of that aside, I miss seeing Mr. Raines perform and hope to again some day. I will gladly open my wallet for his talents, I wish I could say the same for the company I keep at shows, but I cannot.